Do you need a well-deserved break from your normal chess openings? Are you tired of constantly having to keep up with modern chess theory? Or perhaps you simply wish to try out something new and exciting, but cannot decide amongst the embarrassment of choices available? Look no further for the answer! In Dangerous Weapons: The French, International Master John Watson takes a revolutionary look at one of the most famous and widely-played chess openings: the French Defence. Instead of travelling down well-trodden and analyzed paths, Watson concentrates on fresh or little-explored variations of the French, selecting a wealth of 'dangerous' options for both colours. 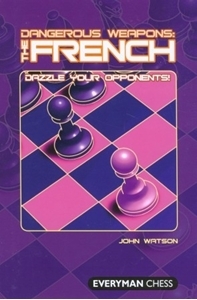 Whether playing White or Black, a study of this book will leave you confident and fully-armed, and your opponents running for cover! Dangerous Weapons is a brand-new series of opening books which supply the reader with an abundance of hard-hitting ideas to revitalize his or her opening repertoire. Many of the carefully chosen weapons are innovative, visually shocking,incredibly tricky, or have been unfairly discarded; they are guaranteed to throw even your most experienced opponent off balance.